Green Sedan 12" x 18" $225.00 Original + S/H/I. Stretched, Prismacolor, 12" x 18" SOLD. The General Lee 12" x 18" $225.00 Original + S/H/I. TJ's Trucking Semi, Prismacolor, 12" x 18" SOLD. BLOWN! 2' x 4' Acrylic, $1500.00 plus S.H.I.P. Flaming Rod, Prismacolor, 12" x 18" $225.00 Original + S/H/I. 1957 Chevy Belaire, Prismacolor, 12" x 18" $275.00 Original + S/H/I. 1957 Chevy Nomad, Prismacolor, 12" x 12" $150.00 Original + S/H/I. 1965 Ford Falcon, Prismacolor, 12" x 12" $150.00 Original + S/H/I. 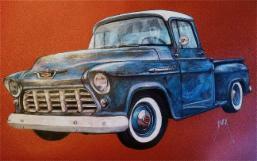 1957 Chevy Stepside Pickup, Prismacolor, 12" x 18" $275.00 Original + S/H/I. Dimitri's Rolls, Prismacolor, 12" x 18" $225.00 Original + S/H/I. 1970 Dodge Challenger Convertible, Prismacolor, 12" x 18" $250.00 Original + S/H/I. 1970 Chevrolet Chevelle, Prismacolor, 12" x 18" 275.00 Original + S/H/I. Dennis Gage Autographed 1969 Yenko S/C Camaro, Prismacolor, NFS. 2005 Chevrolet SSR Cowl, Acrylic, 16" x 20" $350.00 Original + S/H/I. 1965 Ford Thunderbird, Acrylic, 16" x 20" $350.00 Original + S/H/I. 1960 Rocketship, Acrylic,18" x 24" $850.00 Original + S/H/I. Ferrous Wheel, Acrylic, 48" x 60" (4 feet x 5 feet) $3000.00+ S/H/I. Chieftain Falls, Acrylic 24" x 48" $1500.00+ S/H/I. Chieftain Falls, Ferrous Wheel, and Reflection Perfection were on display as a triptych at The Pine River Area School's media center, Tustin, Michigan. Reflection Perfection, Acrylic 24" x 48" $1500.00+ S/H/I. 1965 Ford Galaxie 500 Convertible, Prismacolor, 12" x 18" $225.00 Original + S/H/I. THX138, George Lucas' Dream, Prismacolor, 12" x 18" $300.00 Original + S/H/I. 1970 GTO Pontiac Convertible, Prismacolor, 12" x 18" $250.00 Original + S/H/I. 2005 Dodge Charger, Prismacolor, 12" x 18" $250.00 Original + S/H/I. Cougar, Prismacolor, 12" x 18" $225.00 Original + S/H/I. Four Winns Night, Acrylic, 12" x 18" $450.00 Original+ S/H/I. 1972 Oldsmobile, Prismacolor, 12" x 18" $225.00 Original + S/H/I. 1932 Ford Sedan, Prismacolor, 12" x 18" $275.00 Original + S/H/I. Cason Racin', Acrylic, 24" x 36" $750.00 + S/H/I. Low Cash Ride, Pen & Ink & Watercolor, 11" x 14" NFS. Reaper Creeper, Pen & Ink & Watercolor, 11" x 14" NFS. Truckin' (Chevy Cameo) 16" x 20" Acrylics, $350.00 Original + S/H/I.